Food on Foot - Tia D.
Tia D.’s mother died from a brain aneurism when she was 5 years old, leaving her and her 9 other siblings behind. 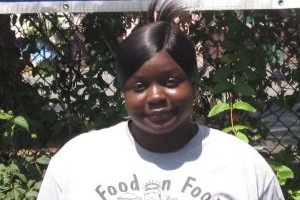 Despite her difficult childhood, Tia graduated our WFF program on December 22, 2013! She has maintained her full time job at Fabiolos Restaurant in Hollywood, CA. She moved here from Ohio to become a police officer and says she is still pursuing her dreams.